The heart is a muscular organ in humans and other animals, which pumps blood through the blood vessels of the circulatory system. Blood provides the body with oxygen and nutrients, as well as assists in the removal of metabolic wastes. 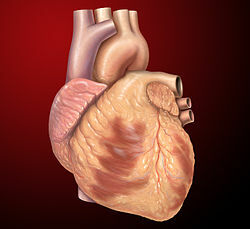 The heart is located in the middle compartment of the chest.